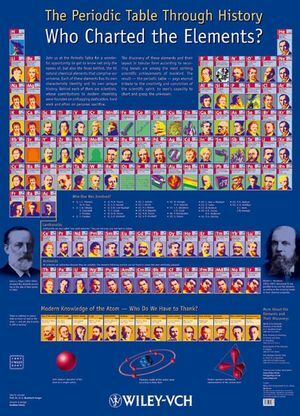 The ideal present for science lovers of all ages: A century after the death of Dimitrij Mendelejew, the Russian scientist who devised the first periodic table for the chemical elements, comes the history of element discovery in the form of this instructive and visually appealing wall chart. The familiar table is used as a template to display the portraits of the scientists who discovered each element, complete with their names and dates. In so doing, it captures the excitement of scientific discoveries by focusing on the discoverers as well as on their discoveries. Elements known since antiquity, for which no discoverer can be named, are depicted with an archeological object documenting their earliest known use by mankind. Additional facts about the history of the chemical elements, such as the development of the atomic model and the scientists behind it, are displayed in the margin. The most stunning and eye-catching periodic table poster available today -- thanks to more than a passing reference to pop artist Andy Warhol -- brings history to life, making this a perfect education tool for the young generation. Printed in brilliant colors and mounted on strong, laminated paper, this is the ultimate decoration for every classroom, lab or dormitory wall. Prof Hans-Jürgen Quadbeck-Seeger was a long-serving member of the board at BASF, the world's largest chemical company. He is honorary professor at the University of Heidelberg, was President of the Gesellschaft Deutscher Chemiker, a member of the senate at the Max-Planck Society and has over 50 patents and several books to his name. The familiar periodic table of the elements is used as a template to display the portraits of the scientists who discovered each element, complete with their names and life dates. Elements known since antiquity, for which no discoverer can be named are depicted with an archeological object documenting their earliest known use by mankind. Additional facts about the history of the chemical elements, e. g. the development of the atomic model and the scientists behind it, are displayed in the margin of the table.